If there is one thing you need to know about the drive between Calgary and Yellowknife, it is the fact there are unpaved portions of highway in the Northwest Territories. In one section of these roads, I was driving when all of a sudden I heard a loud ping and crack. I gasped aloud and the rest of the passengers looked up front. Smack in the middle of the windshield was a sizable chip, measuring about one or two centimeters. With my typical “Type A” personality, I started internally freaking out. I knew this could be taken care of because I was covered by my credit card insurance, but I still worried about what I had to do next. When we got to our next stop, Editor-in-Chief Jonathan Kwan came over to inspect the damage. He looked at it and laughed saying, "Thank goodness it is a rental!” Clearly, we had two different lines of thought, but I knew he was right. Even if the chip was on the car he rented, he would probably still be as nonchalant about it. As you can see, you can have two different perspectives that will affect your outcome. As we have seen with recent computer cases, the trend is often moving towards premium materials. One approach to this could be a slow and steady route by incorporating more metal and a glass panel for a revision of the same case. On the other hand, case manufacturers could just go straight to the edge by going glass and metal everywhere. This is what we have with the SilverStone Lucid LD01. Unlike my situation, these two different approaches result in different outcomes, but they target the same goal. Is SilverStone's approach a winning option or will we find some figurative chips and cracks when we are finished? Let us read on to find out! 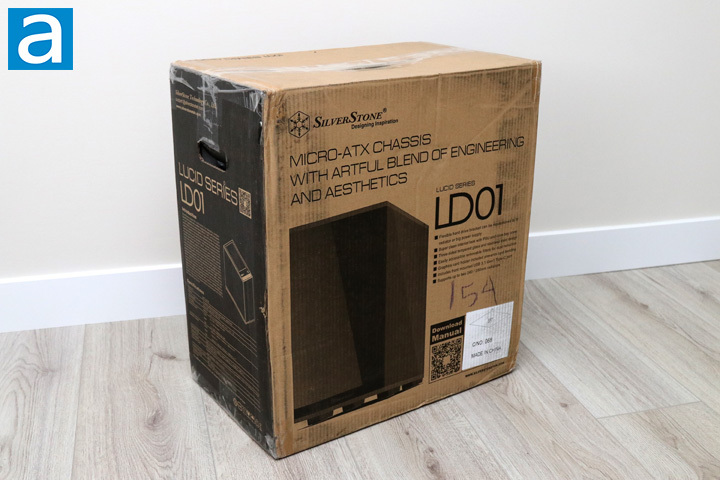 Today's review unit of the SilverStone Lucid LD01 arrived via FedEx's ground service, from SilverStone's offices in Chino, California. It is surprising to see how everyone is going towards the orange and purple carrier, especially since we have seen a lot of UPS in the past. I guess there has been a shift overall for the shipping carriers, which is interesting. The enclosure was shipped well, as there are no notable dents or scratches to be concerned about. Otherwise, the box arrived in its retail container with no extra shipping container. As a computer case is generally a larger package, it makes sense there is no additional cardboard box here. The retail container is a standard black and white affair with no color on the external box to speak of. The product name is printed clearly on the side panel with a picture of the case beside it. Its product description of a "Micro-ATX chassis with artful blend of engineering and aesthetics" is printed right under the SilverStone logo. Around the box we have notable features and specifications that we will be looking at later on. 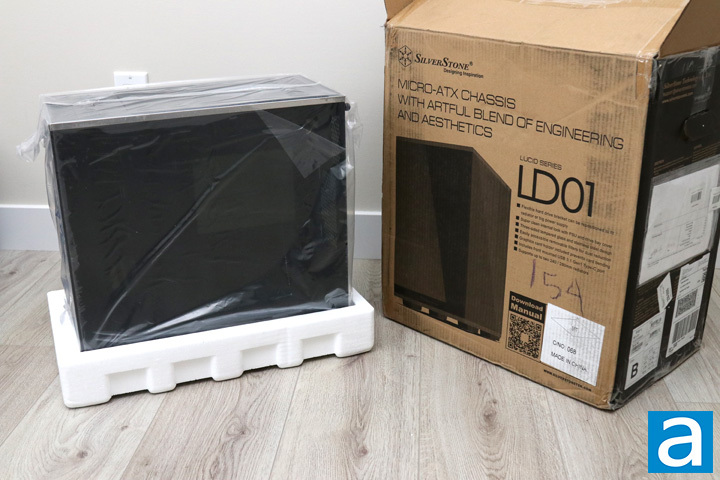 Inside, SilverStone has wrapped the Lucid LD01 in a clear plastic bag to prevent any surface scratches to the case. The whole thing is also surrounded by two foam brackets to prevent more serious damage when the case is being shipped. With a case this heavy and made with lots of glass, thick packaging is important. Thankfully, nothing was damaged in shipping. The glass panels are also wrapped with plastic to prevent any scratches on these sides. Otherwise, a small box can be found in the hard drive tray containing all of the necessary accessories to install your system into the case. posted 7 hours and 51 minutes ago, with 4 posts. posted 15 hours and 6 minutes ago, with 12 posts. posted 15 hours and 11 minutes ago, with 56 posts.